Khmer food has never really been on my gastro radar. I've never reached for the phone book thinking "ooh I could murder a Cambodian". Even after reading the recent posts on Chef Sandwich, I have to admit I was a little sceptical about the attraction of Cambodian food. The descriptions of dishes such as prahok mostly left me intrigued, but not salivating. Was it something I was desperate to try? I wasn't convinced. My own experience of Asian food is the average British experience of Chinese takeaways, Thai restaurants/pubs, Nepalese and Indian curries, and the odd festival flirt with Tibetan cuisine. I often use Asian ingredients in stir fries, curries, soups, marinades etc but don't think I can say I've nailed a specific Asian dish. But given the opportunity to visit my old friend Lennie Nash (below), I arrived in Cambodia with an open mind, hesitant palate, and high-strength stomach tablets. THE CAMBODIAN capital, Phnom Penh, is a manic, vibrant and beautiful city. Painted pagodas sit serene as life bustles past. The streets are alive with the endless drone of mopeds loaded to the hilt with anything from whole families, monks, sacks of rice (wife on top), bushels of grass, and even other motorbikes. Among them weave the tuk tuks, whose drivers relentlessly plague Westerners in hope of a fare. 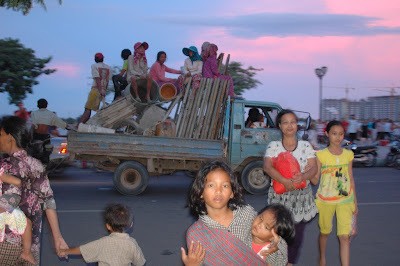 Giant Land Cruisers and Hummers cruise the main drags, a reminder that there is a growing, privileged elite in Cambodia who are not struggling to get by on $2 a day. Besides the traffic chaos, the ubiquitous sight amid the palaces and pagodas, lady bars, mobile phone shops, and motorbike repair dens is food. 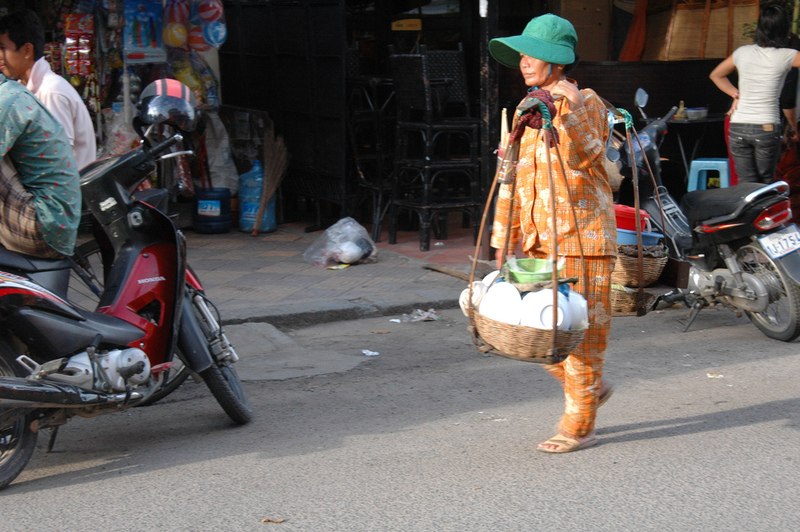 They say the Khmers graze - small meals throughout the day as and when - and there is certainly plenty to choose from. Food is everywhere - restaurants, market stalls, and street hawkers balancing crockery and cooking pots on either end of a shoulder-supported pole like giant weighing scales. Toddlers selling boiled quails' eggs, juice sellers with giant mangles to crush sugar cane into a sweetly refreshing drink (the last crush always includes a segment of green orange for a deliciously zesty hit), and the street food heroes with their tarpaulin-covered mobile kitchens - the ultimate in fast food joints. Street food around the world often captures the essence of the country - its aspirations, its roots, and its everyday fuel for life. And from Bogota to Benin to Bangkok, it is sold under a blue tarp with a dubiously attached light bulb, glass box showcasing the cooked wares, and some sort of cooking or reheating device. 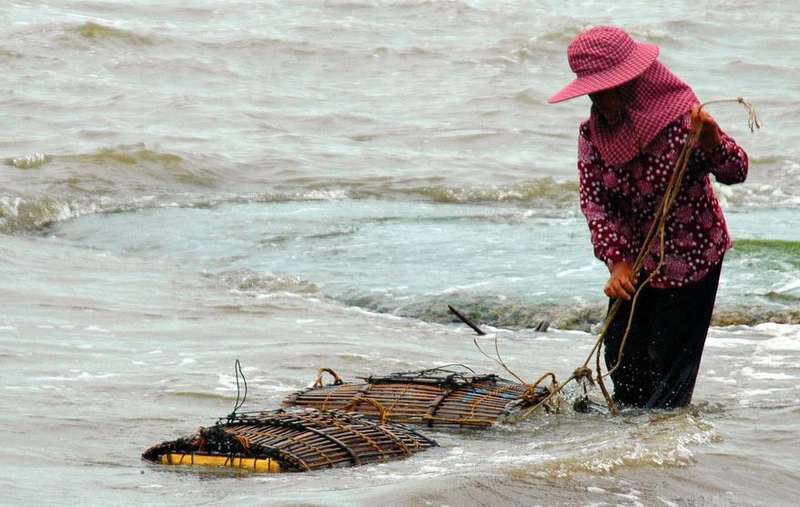 In Cambodia, food hawkers offer everything from fried pork or Chinese-style roast duck, endless soups and noodles, beef stews, and grilled fish, to trays of fertilised duck eggs, pate-filled baguettes, green mango salads, fish fritters and dim sum. These dishes are the real taste of the country. Restaurant chains may have their place - you know what you're getting, and there may be slightly stricter health and safety procedures - but street food has character and is what makes the everyday people tick. Okay, it's rice three times a day - chicken rice soup or grilled pork, rice and pickles for breakfast, hot, herby noodle soup, or tom yam broth, at lunchtime in the tropical heat, with a side plate of rice, and fried or barbecued meat or fish with rice in the evening. Boiled rice, fried rice, sweet fermented rice, sticky rice you can heap on to chopsticks, rice to soak up the meat juices, mop up the soup, but always rice. There's always a dipping sauce too - the salt, pepper and lime combination, or a chilli dip or soy sauce - basically, here's some rice and a little protein to fill you up, how spicy, sour, sweet, or salty you like it is up to you. The food is nearly always freshly cooked, you're eating outside, and there's no rush to clear your table for the next sitting. One of the best meals I had wasn't in fact from the roadside freelancers, but it was along the same principles. Outside an open-fronted restaurant, with its plastic chairs and tables, packed with beer tower-glugging locals, was the star of the show - a whole spit-roast cow. Okay, no head, but all the rest, unceremoniously skewered from end to end - nature obviously had this treatment in mind - and slowly spit-roasted over hot coals until the meat is perfectly pink. It's sliced off, grilled a bit more on the BBQ, and soon there is not a scrap left. Get to the restaurant too late and there’s often just a sorry-looking leg attached to the spit. 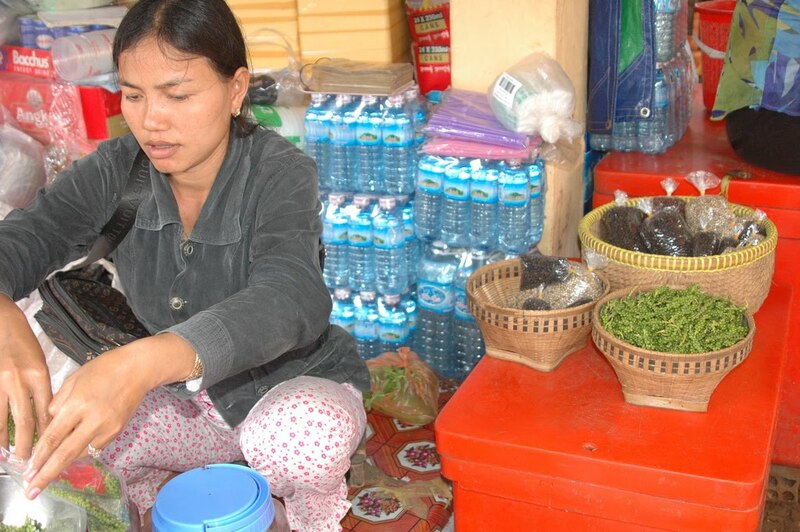 We stumbled across the start of the process during a bike ride along the Mekong one morning. 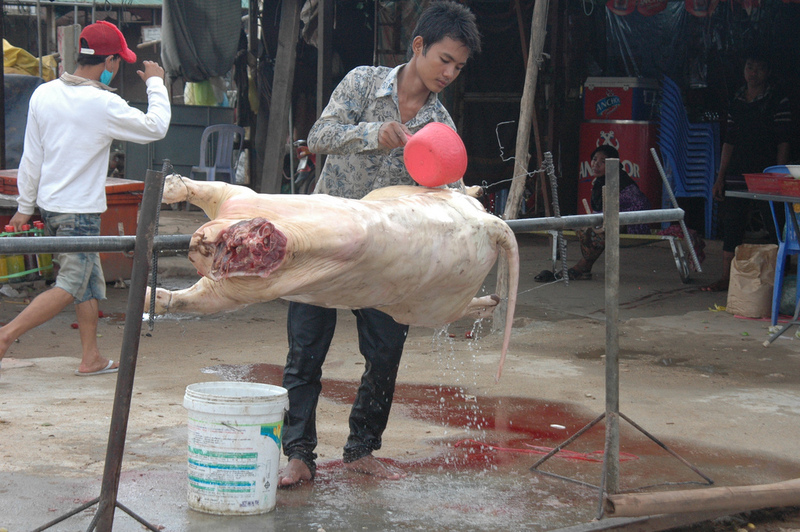 A boy was washing down and preparing a calf’s carcass for that night's service. After carefully cleaning the skin, he poured a mixture of lime juice and spices into the stomach cavity, then a huge handful of herbs, before sewing up the gap with wire and transferring the meat to the spit. Hog roasters would look on with envy. We returned a few hours later, and the meat was slowly cooking, but being tended to all the time. It was a mouth-watering smell and that evening we headed straight for our nearest BBQ cow (koo dut) joint. Served with the chunks of succulent steak and ribs was rice, of course, with the salt-pepper-lime combo, which is perfect with spit-roasted beef and, I noted, the infamous prahok fermented fish cheese - "freshwater fish fermented in barrels of brine for so long they acquire the powerful, roof-of-the-mouth-etching taste of blue cheese." It doesn't sound that appealing really, does it? But mixing some of the greyish sauce with a spoonful of trustworthy sticky rice, I was won over straight away. I really couldn't stop eating it. Dipping meat into it, or chunks of crisp vegetables resting on ice, or just spooning it over rice. Fantastic. Sadly, not something that you could recreate back home without a whole lot of mess and fuss from neighbours and local cats. But maybe that is the secret - real Khmer food, you'll only find in Cambodia. Heading south from the capital we hit the coast. Fried langoustine-type shellfish from beach sellers as you lounge by the sea, beautiful tropical fish - caught by bamboo rod and line (with these very hands) - and barbecued with a chilli, sugar, salt and lime rub by the crew. Freshly-boiled blue swimming crabs crunched and cracked as the high tide lapped the edge of the restaurant shack in Kep. If you thought picking a crab from a tank is fresh, we watched as the waitress disappeared out of the front of the restaurant to reappear with the crab ladies on the rocks behind us. A crab lady then waded out to her reed-woven pots, pulled one ashore, picked out a few meaty crabs from the tiddlers, and handed them to the waitress, who tottered back to the kitchen. Eating crabs is a slow, messy business, but even the smallest were packed with fleshy white chine meat and creamy, brown head meat. Taking your time cracking and slurping through the shells as the breeze blows in off the sea, is one of those holiday moments. And then there was squid with fresh, green peppercorns, which were the discovery of the trip for me. Again, like prahok, it was a wow, that's a fresh new taste. The little green corns, clinging tightly to the stalk, are stir-fried with squid or crab for no time at all. Fresh, peppery, slightly soapy (but not in a bad way) explosions as you crunch through the whole lot, stalks and all. And they are seasonal, so you can only really get them at their best between September and February, when the harvest moves on to the black and red corns for drying. I did find some on my return to the UK in a Thai supermarket, but having travelled they were starting to go black and the stalks were tougher. 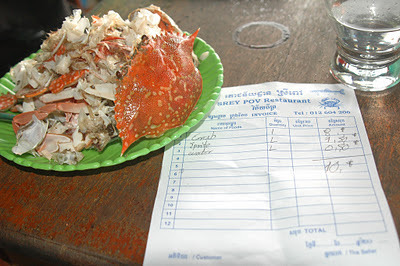 Still, it was enough of a green pepper pop to bring memories of Kep’s famous crab market flooding back. But it’s enough to get a real taste for the clear, zingy broths, simply cooked meat and fish with accompanying dips, fragrant herbs and, funnily enough, boiled rice. :: Dom Bailey is a writer and singer-songwriter. His songs are here at domssongs.blogspot.com. This post is amazing! Love your descriptions. 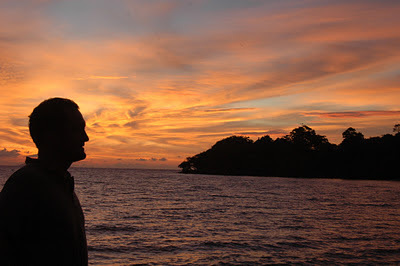 I've lived in Cambodia for 2 years, and really appreciate your post.